Samus's Varia Suit was the best addition to the Monster Hunter 4 Ultimate, changing the entire feel of the game into a semi-authentic Metroid experience. However, she now falls to second place thanks to Capcom mining its own franchise library for the most adorable match-up I've ever seen. 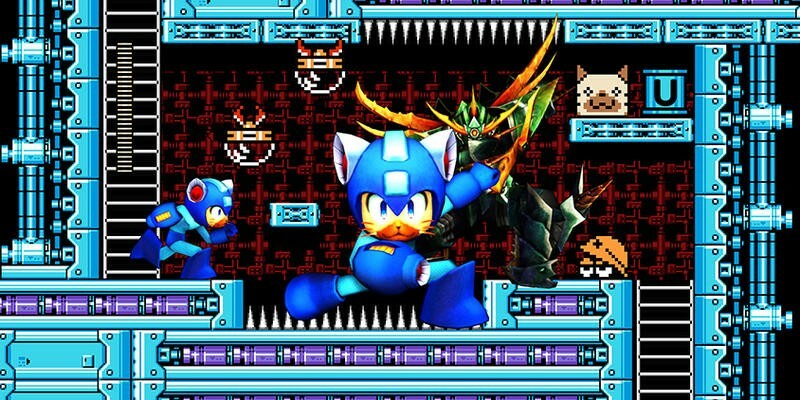 The adorable cat-like sidekicks in Monster Hunter 4, known as Palicoes, will have the chance to equip Mega Man's classic armor, finally combining the Blue Bomber with everyone's favorite Internet meme: cats. The trailer starts off nostalgic enough with Capcom showing off happier times for its most iconic character with NES clips of Mega Man 2 and the rest of the series. Our hero jumps into action in Top Man's stage from Mega Man 3, and he nabs a mysterious power-up transforming him into a Palico! Switching to Monster Hunter mode, the Palico takes on a band of monsters with his Mega Man inspired armor, boomerangs, and grenades. The 8-bit sound effects match perfectly with the modern day graphics, and man, he is just drop dead awesome climbing up those vines, isn't he? And just when you thought it couldn't get any better, Capcom reveals how the Palico uses the classic Rush power-ups. Mega Man's loyal robotic dog is not a jet or a submarine in this game, but rather he is a hammer! Bash enemies over the skull and defend from incoming attacks, how did we never get around to that one in the olden days? Best of all, Capcom has confirmed that everything seen in this trailer will be coming to America when Monster Hunter 4 Ultimate releases for the Nintendo 3DS in early 2015. I am willing to just roll over and accept that Mega Man is nothing more than a happy, nostalgic memory for both me and Capcom, and if seeing him pop up in games like Monster Hunter and Super Smash Bros. are the only way he can remain relevant, then so be it. It's a little sad though that one of gaming's founding icons could be reduced to "DLC package" status, but maybe, just maybe, if enough people buy his add-ons, Capcom will find it in themselves to fix the slump he currently finds himself in. This one's for you, Mega Man!